Actually, that's exactly what Randy wanted, but our teacher, familiar with Randy's homicidal tendencies, regularly intervened on our behalf. I was sitting next to Mark. I didn't know him, but his porcelain skin, rosy cheeks, big brown eyes, and shiny black hair made him look like a cherubic baby doll. We were sitting so close our hands almost touched. As I watched him bounce up and down, I had an epiphany; I loved him. And what better way to express my love than by putting grass on his head? I waited for my teacher to look away and then executed my plan. As my classmates bounced, I quickly leaned back, ripped out a handful of grass, sat back up, and started bouncing again, hiding the contraband in my fist. There was only one thing left to do; I leaned over and stealthily dropped the grass on Mark's head. The bright green blades stood out beautifully against the canvas of his shiny black hair. I waited for his reaction to my romantic overture. Would he laugh? Put grass on my head? Ask me to marry him? None of the above. He started bawling. He didn't even shake the grass off his head; he just sat there wailing, paralyzed by my seemingly unwarranted attack. The other children stopped bouncing to watch the drama unfold. "Bonnie!" scolded my teacher, brushing the green blades from Mark's hair. 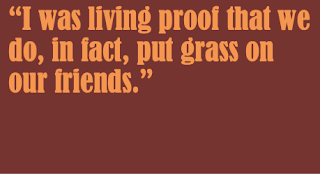 "We do not put grass on our friends." 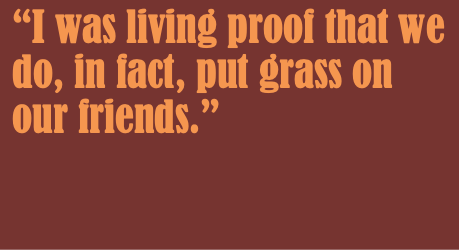 I hesitated, debating whether to correct her logical fallacy; I was living proof that we do, in fact, put grass on our friends. "Say you're sorry to Mark." I wasn't sorry, so I didn't say anything. Besides, Mark was crying so hard he wouldn't have heard my apology. "Go see the principal," my teacher ordered, pointing toward the office. Fighting back my own tears, I stomped off in exile, a preschool pariah. The principal, having seen my sneak attack through her office window, made me sit on a chair for the rest of the morning until my mother could pick me up. "Bad children don't get to play with other children, so you'll have to wait here." As Mark continued to yowl in the distance, I had my second epiphany of the morning - my cherub was nothing more than a crybaby. A scene from childhood beautifully imagined or re-imagined. A little parable of human miscommunication - wouldn't it be great if we grew out of making such unwitting missteps! Perfectly executed. A true-to-life slice of life. Very nice. A perfectly rendered slice of life from childhood. Loved the logic of putting grass on her beloved's head to show affection and loved his reaction. The ending made me laugh out loud. A gem. One thing I like about fiction on the web is the variety of stories. On Friday, a gripping adult drama by a masterful writer, today something completely different, a simple child's tale. Cool! A pointed, poignant, and deceptively simple piece about love, romantic disillusionment, and logical fallacies. It's also hilarious. Loved it! The author has a fine-tuned understanding of how little adults understand about how much goes on inside the heads of even the youngest children -- unless, of course, said adults have sharp memories of their own thoughts from long ago. The story is so well done I felt like I was there in person watching it unfold in front of me. Great story. I laughed out loud! Really enjoyed the child’s eye view of the world. This is fantastic! Love the imagery -- I can see every detail. And I laughed very hard at the ending. Well done!! Having written "Nursery School Expose'" which was picked up by FOTW in 2013, what Bonnie did, supported by her infallible logic and childhood emotion makes perfect sense. These kinds of acts are the purest, most simple gestures and I loved the honest dialogue, and hope Bonnie continues to put grass on boy's heads until she finds the boy who returns the favor.